Disclaimer: The link above are sponsored. I suggest you some vendors that I already trusted or that seems of confidence, but I have no direct connection with them. We must define the length of the 9 pipes. The table below will help you in this behavior. If you use the same pipe as me (Ø22x1 copper), you may keep the table presets, otherwise you must enter your own values (length and frequency of your sample pipe). First, cut a pipe piece length 250mm for example. To have a good sound, you must hold the piece at 22.4 % of its length from each side, for example with rubber : these are the last column values, which is 56mm for my 250mm piece. 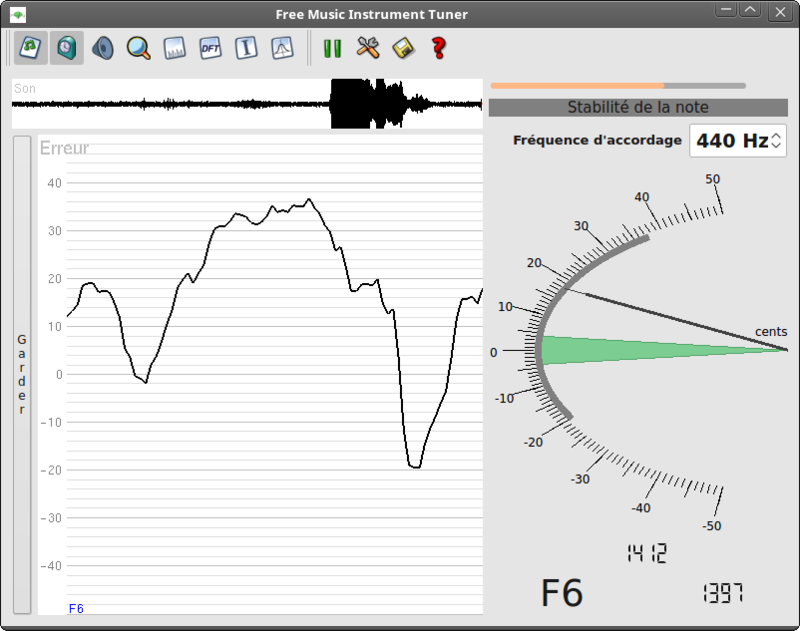 Real-time frequency (1412), the name of the closest note (F6), and the theoretical frequency of this note (1397). What we need is the average real-time frequency. Once you have it, you can fill the the form below with this frequency and the actual length of your pipe. Then you will have all the pipe length computed for your own material. It is about how to compute the length by yourself. If you use the above table, you may skip this chapter. The pipe resonance frequency depends of its diameter, its thickness, its material and its length: the only value you can modify is the length. Then the goal is to find the length of all your tubes to have the desired notes. 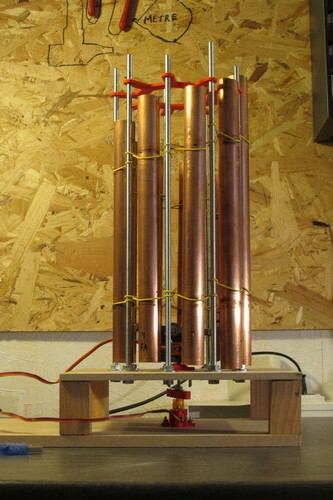 where f is the frequency (Hertz), A is a constant (mm2/s), and L is the length of your pipe. 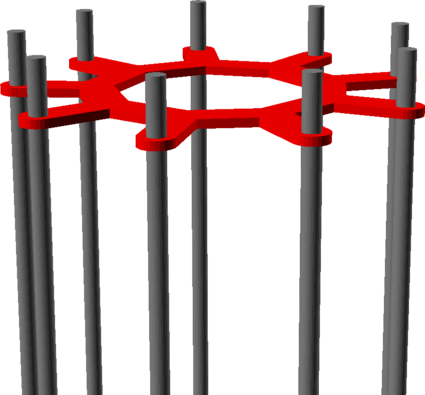 It is possible to compute A from the geometry and material of the pipe, but it's hard with custom material (see the manual for more details). Instead, we will infer A from L and f: L is the length of your sample pipe (250mm), and you will use the software to measure the frequency. Cut the pipes with the computed lengths, a little bit taller. 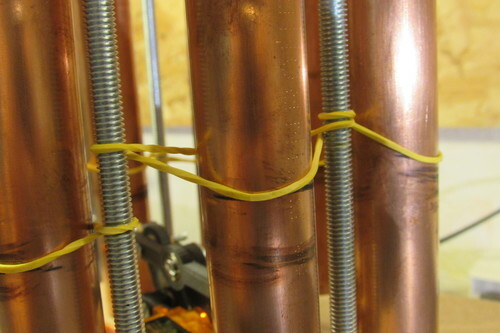 Put the pipes on a proper support, and measure their frequency. If the frequency is too low, slightly shorten the pipe, then measure the frequency again. Don't forget to tune your first sample pipe. Take a wood plate (top), and find its center. Draw a 30mm circle on its center, then put the «ecarteur» on this circle. 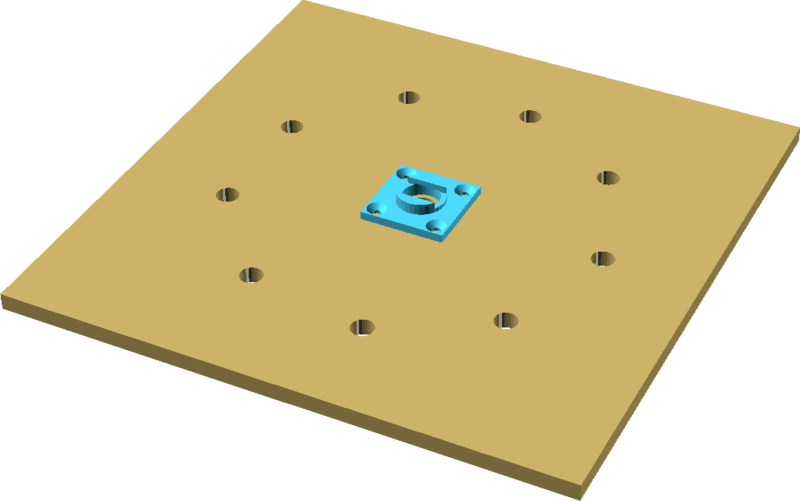 You will use this piece to draw the 9 Ø6mm holes you have to drill on the plate. Drill a hole on the center too. Take the other plate (bottom). 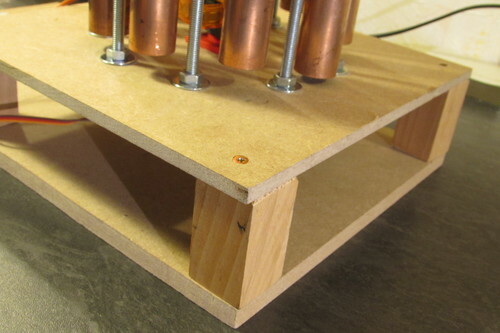 Use the «support» piece to clamp a servo on it. Be sure the servo axis is on the plate center. 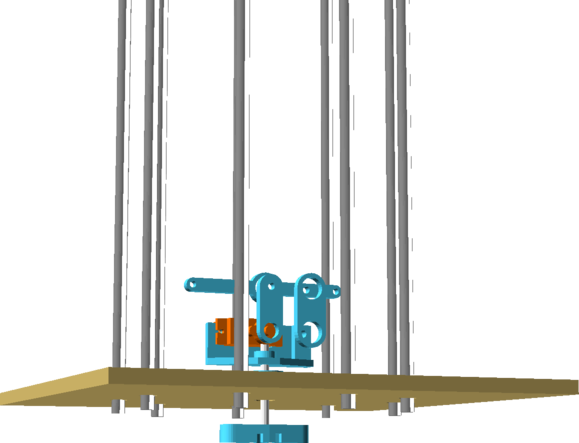 Mounted on the servo axis, you must have the arm that fits into the «coupleur» part. Grind the two sides of the M4 screw head, so that the screw fits into the «coupleur» and doesn't spin. Clamp the screw on the «coupleur» with a washer and a nut. Place the screw through the top plate and the «palier». 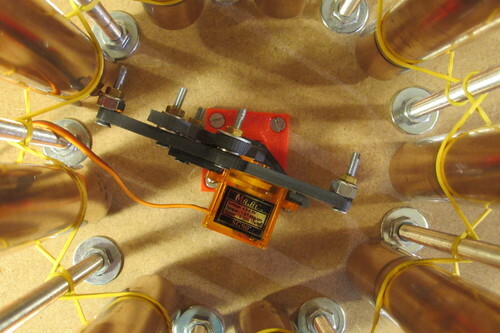 Then, insert on the screw a nut, a washer, the «plateau» piece, a nut, and tighten them all. 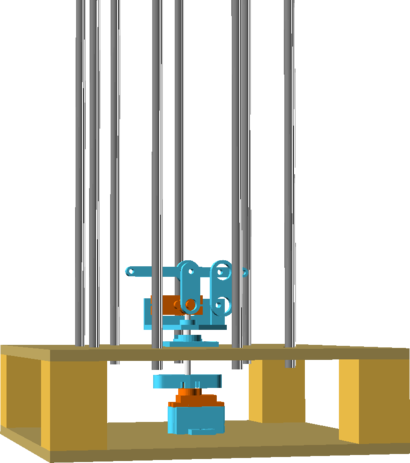 Finish the assembly with the Ø3 bearings, the «bras» and «bras2» parts, «tourelle», «marteau» and a servo. It may be better if you can add some nuts on the hammer endings. 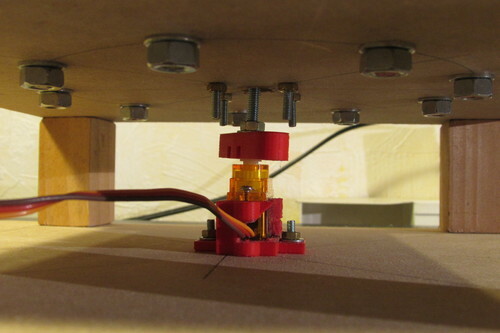 Warning: the servo arm must be vertical when set at 90°. 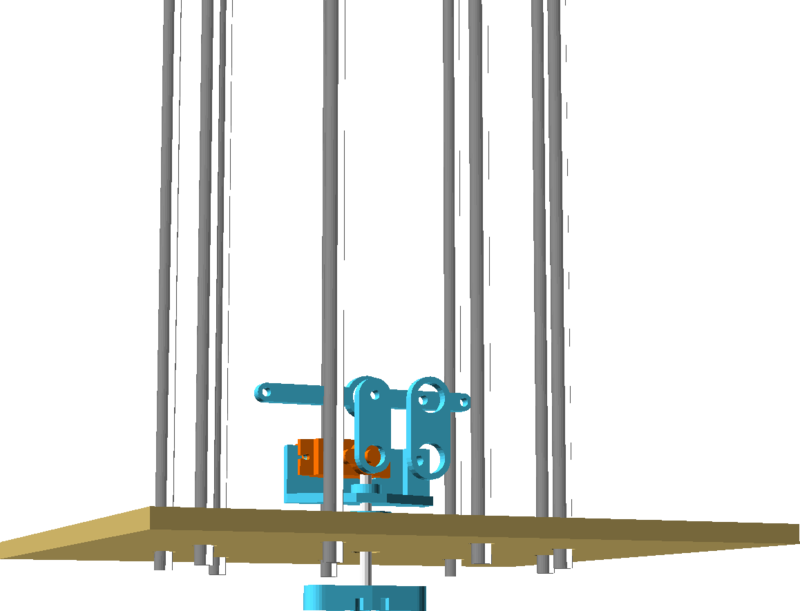 You can ensure that by using the «servo90» sketch. 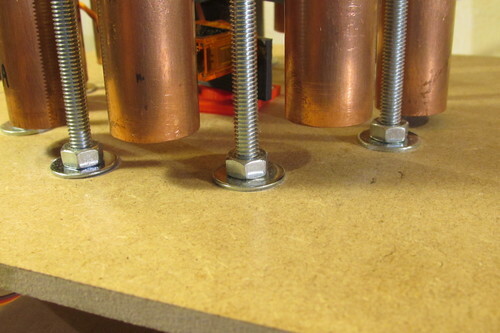 Cut the threaded rods 33cm long and tighten them on the top plate using two nuts and two washers for each chunk. Clamp the four feet on the bottom plate using four wood screw. Place the top plate, ensuring that «axe» will fit on the servo. Clamp the plate with four screw. You must now place the rubbers! Start to insert the bottom rubbers across the rods, starting where the shortest pipe will be. Then, do the same with the top rubbers, starting from the same direction. 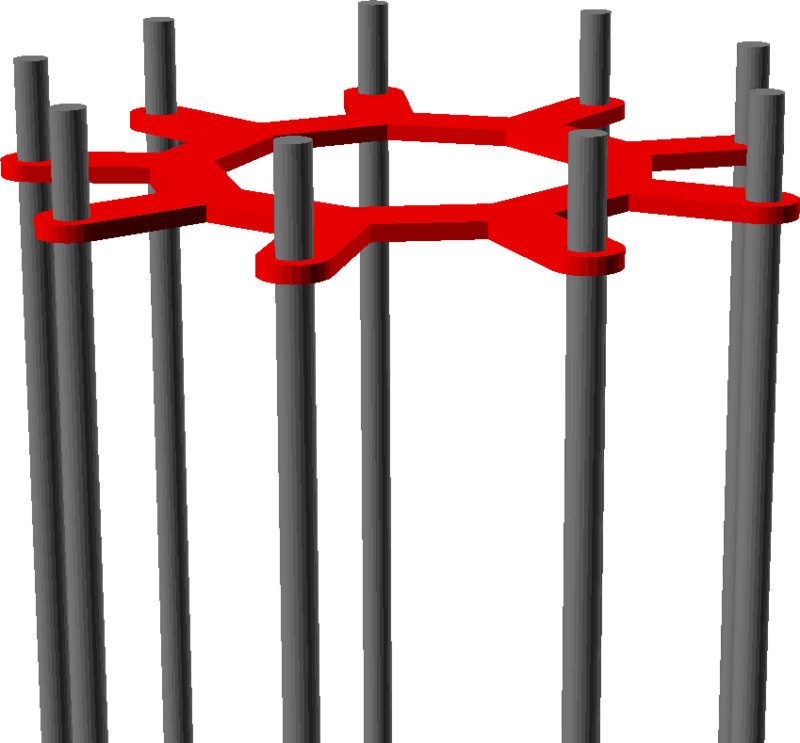 Now place the pipes through the rubbers, ensuring the rubbers are at the 22.4% position. The pipes must be aligned on the bottom, not touching the plate, so that the hammer can hit each pipe. It's time to wire the servos. Connect the first servo «data» wire (bottom servo) to the Arduino pin #9, and the other servo «data» wire to the pin #3. The servos power wires must be connected to a dedicated power supply, because the servo can reach a consumption peak which is too high for the Arduino. 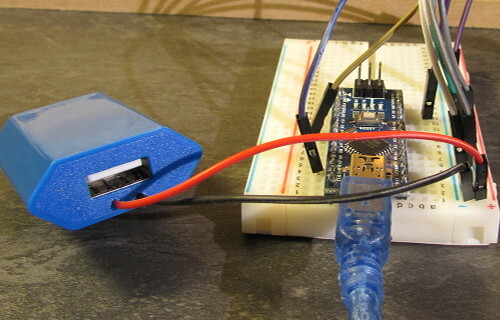 Don't forget to connect the Arduino ground to the dedicated power supply ground, otherwise the Arduino cannot control the servos. On the top of this article, I suggest you two wall warts: one can be connected on the Arduino USB cable, and the other should be a bit modified to add two wires that can be plugged on the servomotors (open it and sold the wires properly on the 0 and 5V pins). 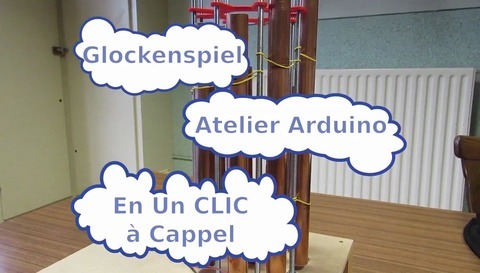 Open the glockenspiel.ino sketch with the Arduino IDE. Be sure the servo library is already installed into your IDE. The notes1 table contains all tube positions (from 0 to 180°). The pipes are 40° spaced, then it is easy to find all tube positions since you have the first. 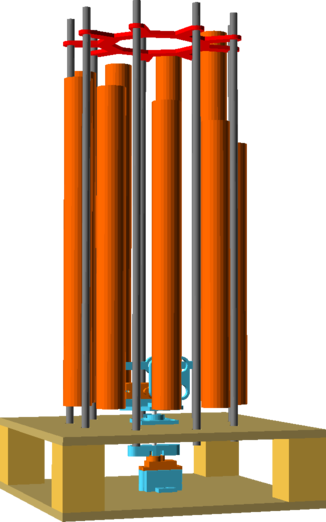 The taller pipe will be notes1. The notes2 table contains the hitting angle of servo2. The value is positive or negative depending the direction of the strike. You can adjust this value for each pipe, to compensate a bad alignment of the assembly. Into the tableautemps table you will find the shortest note duration for each melody (each melody may have its own tempo). The partition1 table contains the notes to play number (from 0 to 8). If you have multiple melodies, add the note 9 between each melody. The partition2 tables is used to set the duration of each note. The shortest note will have a value of 1, and all others will be a multiple of this duration. Warning: You must add an extra value before each melody, in order to synchronize the two partition tables. Vérification anti-spam Quelle est la troisième lettre du mot ehkl ?